You can set up your buffer weeks throughout the year, or just add them at the end. Strategically planning these weeks allows you to take a vacation or have planning sessions at optimum times while working around a set goal period. To add Week numbers from within Google Calendar, do the following. Click on the gear icon on the top right and choose settings. Click on the hyperlink for calendars. Under the section other calendars on the right side, select Browse Interesting Calendars and then choose More. You will see an option for Week Numbers. 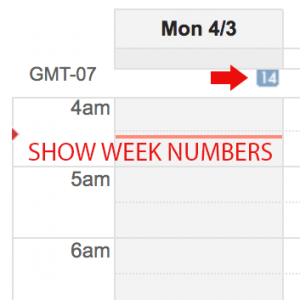 Select subscribe and the week numbers will appear on each instance of Monday in all calendar views. If you are an entrepreneur or small business person, you may have the freedom to set your own planning calendar and not be tied to a corporate time management system. Here are some helpful planning sheets to help you strategize your year. These come in PDF format and are easily printable on most printers. The actual 2017 calendar dates for Mondays are listed as well as week numbers. 50-week calendar with 5 week goal periods. 50-week calendar with 10 week goal periods. How I Use a Planning Calendar. For most projects, I like to use a 5-10-50 Time Management System, using a fifty week calendar, and set project goals for five or ten weeks. I usually plan around a ten-hour day, five days a week. This gives me a lot of flexibility. It makes it real easy to calculate the time I have available for a venture. If I’m working on longer projects, the twelve and sixteen week periods allow me to plan three or four goals for the year. I keep a weekly calendar in my printable journal for reference. Depending on your background, I think you’ll find a weekly calendar to be useful. Add Google Calendar week numbers for reference. 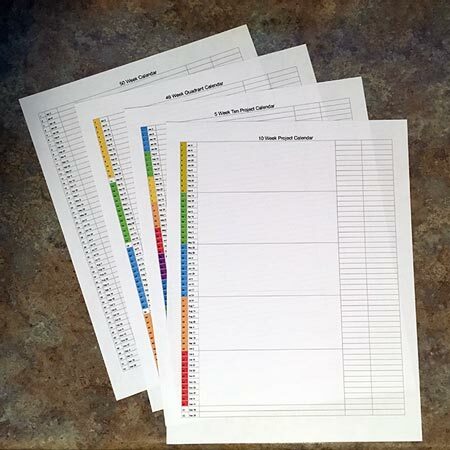 Print out a blank weekly calendar and see how it gives you a different and much simpler view of the upcoming year. I recorded a Daily Drivecast about using these calendars. Make Time Management More Fun! Question: Have you ever worked with a weekly calendar before? Do the ones above make sense to you?